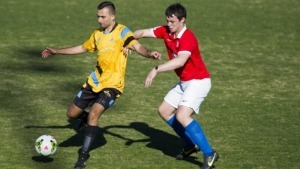 Canberra FC moved into their 33rd ACT Grand Final decider, and their third in succession, with a 2-1 win over Tigers FC at McKellar Park in a hard-fought Preliminary Final. Goals from James Field and Muad Zwed did the damage as FC eased past the challenge of last season’s league champions and gave themselves the chance to repeat their double achievement of 2011. In a stop-start affair that failed to capture the imagination prior to the break it was Canberra FC forward Domenic Giampaolo who fired the first shot in anger, but his effort was easily repelled by Francois Bangweni in the Tigers goal. Arguably, the Tigers had the better of the chances in the first period as Alex Oloriegbe caused issues for his former employers creating an opportunity for Daniel Roberts with a fine run and cut-back only for Roberts’ shot to lack the power to test Sam Brown. Shortly after Oloriegbe got away from the FC defence but dragged his shot horribly wide before Julian Borgna tried his luck from range but saw his drive flash well wide. Tigers paid for their profligacy as FC took the lead in the 29th minute. Field was afforded way too much time and space outside the area and picked his spot to perfection, arrowing his right footed shot into the bottom corner away from the despairing clutches of Bangweni. It was a narrow lead to take into the break and the second goal was to prove crucial. When it came it was simple in its creation and execution. A long ball over the back of the Tigers defence sent Zwed free and he outmuscled his marker to slot past Bangweni. Tigers made several changes in an attempt to get back into the contest and it was one of those, Hussein Fureje, who reduced the deficit in stoppage time, looping a shot over the head of Brown to give the Cooma-based side late hope. It was not to be however, and FC were worthy winners in the end. Canberra Olympic survive to play the Preliminary Final whilst Belconnen United’s season is over following a remarkable match at McKellar Park that ended 4-2 in favour of Olympic. Across a bizarre ninety minutes that ranged from the lethargic to the firecracker, both goalkeepers found the net as Olympic triumphed to book a meeting with Tigers FC at Deakin Stadium next weekend. In truth, Olympic was always the better of the two sides and looked to have a cutting edge in the final third that Belconnen was lacking with Frank Cachia’s team scoring at crucial times and leaving the Blue Devils playing catch-up. They had a firm grip on proceedings by the half-hour mark after Callum Smith had swept Olympic ahead in the 12th minute off a Robbie Cattanach square ball and custodian Angelo Konstantinou, entrusted with the penalty duties after Blue Devils defender Matt Grbesa was penalised for handball, thundered home a spot-kick. Cattanach then dragged a shot across the face of goal when well-placed and Jordan Tsekenis was unlucky to see a lob bounce off the crossbar twice before being cleared as Olympic threatened to run riot. Half-time gave Belconnen a chance to regroup but their uphill battle became a veritable mountain after midfielder Conor Nolan was sent off for receiving two yellow cards in quick succession. When Cattanach slotted home at the end of a lightning fast counter-attack involving substitute Oliver Wiederkehr and Tom McLachlan, the game appeared to be up. However, skipper Taylor Beaton fizzed in a goal off the post to reduce the arrears that lent slim hope to the Blue Devils cause. A second sending off, this time Zac Maybury making the walk in the 77th minute, stymied any false dawns and Olympic’s Adam Rogic sealed the result with a cracker as time was running out. There was still a bizarre denouement as Belconnen stopper Adam Perakovic headed home from a corner, at the second attempt, in stoppage time but it was no consolation to Belconnen who bow out.